Sun Cellular has recently announced a new bundle on their Sun Postpaid Plan 399. 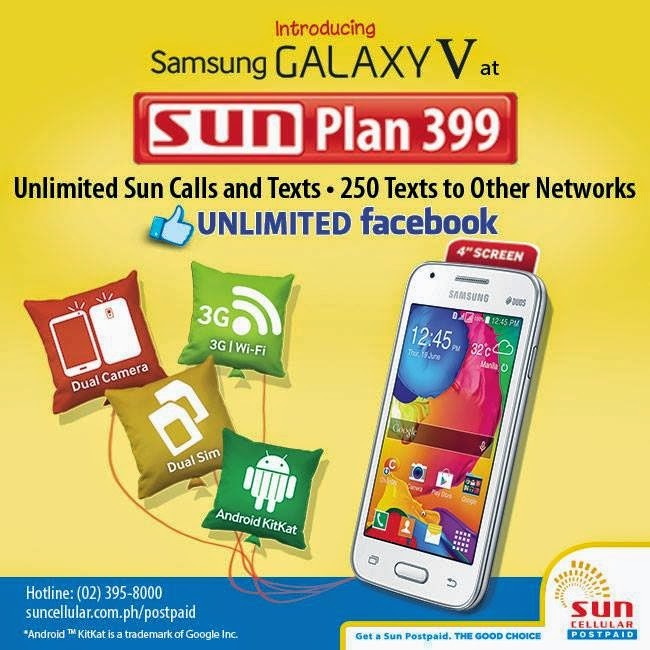 According to their post of Facebook, subscribers can get a brand new Samsung Galaxy V for FREE at Sun Plan 399 with Unlimited Sun Calls & Texts, 250 Texts to Other Networks and Unlimited Facebook. Samsung Galaxy V comes in a 4-inch display panel, Android 4.4.2 KitKat, 1.2 GHz single core processor, 512 MB of RAM, 4 GB built-in storage that's expandable via microSD card slot, a 3 MegaPixel fixed focus main camera with LED flash, VGA on front, a 3G HSPA+ support and a 1,500 mAh Li-Ion battery pack.